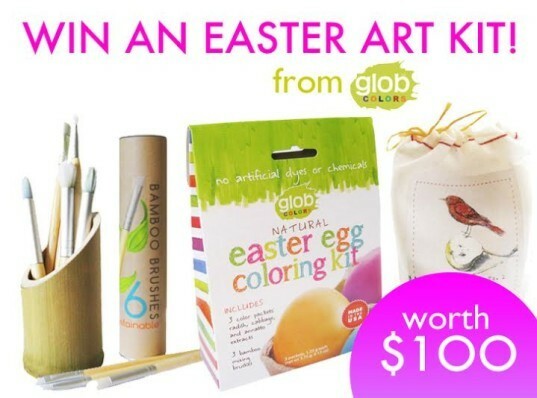 WIN $100 In Eco-Friendly Easter Art Supplies from Glob Colors! Easter will soon be here in all its pastel-colored glory. This is a great time to plan fun, Spring-related crafts with the family, but traditional art supplies are laden with chemicals and unsustainable materials that just aren’t healthy. Instead of toxic dyes and paints, why not create treasures that are good for kids and the planet? Our sister site, Inhabitots, is giving away a $100 prize package from Glob Colors with a variety of all-natural, safe and eco-friendly art supplies sure to ignite fresh artistic creativity in your little one. Find out how to enter by following the link below! Easter will soon be here in all its pastel-colored glory. This is a great time to plan fun, Spring-related crafts with the family, but traditional art supplies are laden with chemicals and unsustainable materials that just aren't healthy. Instead of toxic dyes and paints, why not create treasures that are good for kids and the planet? Our sister site, Inhabitots, is giving away a $100 prize package from Glob Colors with a variety of all-natural, safe and eco-friendly art supplies sure to ignite fresh artistic creativity in your little one. Find out how to enter by following the link below!